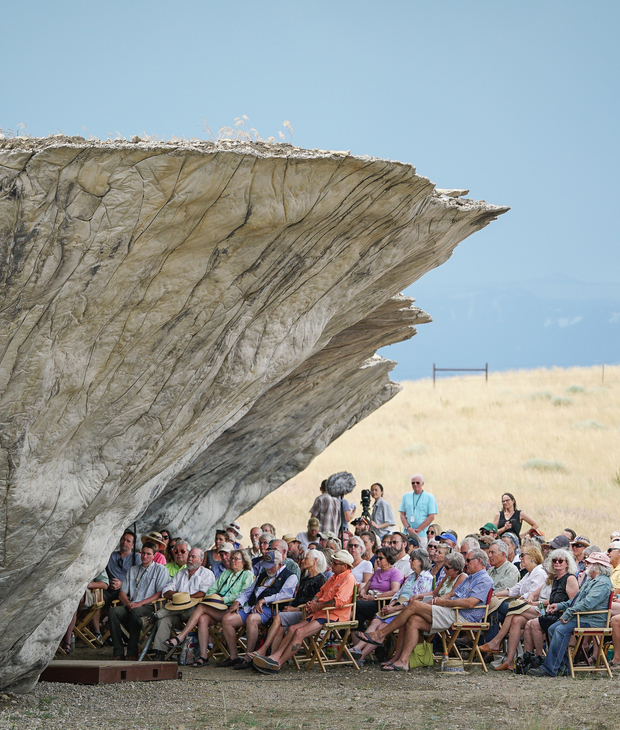 Tippet Rise will reopen to the public for sculpture tours on Friday, July 5, 2019, one week before the start of the summer music series. During Season Four, the art center will be open from 9am - 4pm on Fridays, Saturdays and Sundays. From the car lot at the Billings airport, turn left onto the immediate rotary. At the rotary, follow N. 27th Street toward the City Center. Drive straight through Billings to Interstate 90. It’s a total of 3.4 miles from the airport rotary to the interstate. Take I-90 west toward Butte. After 30 minutes or so, take the MT 78/#408 exit into the town of Columbus. Highway 78 winds from the interstate through Columbus. You’ll come to a “T” in Columbus, go right. Then, quickly make the first left onto S. Pratten Street and cross the railroad tracks. You are still on Highway 78. Drive 12 minutes or so to Absarokee. Once you’ve entered Absarokee, please drive slowly (the speed limit is 25mph). At the flashing light in downtown Absarokee, turn right onto West Grove Street, which will soon become Stillwater River Road. Travel 6.1 miles. Just after the 6-mile marker, turn left onto Grove Creek Road. There will be a white house on your right at the turn. Continue on Grove Creek Road. After 2 miles you will meet a four-way intersection, continue straight. The road becomes South Grove Creek Road. Disregard the “No Outlet” sign. Follow the interstate 98.4 miles to the MT 78/#408 exit. Take the MT 78/#408 exit into the town of Columbus. Highway 78 winds from the interstate through Columbus. You’ll come to a “T” in Columbus, go right. Turn left onto MT-78 North. Travel 27.8 miles and turn left onto Nye Road/Slim’s Lane at the Rockin’ J Gas Station. After roughly 3 miles, you will enter the town of Fishtail. Continue to follow Nye Road through town. You will see the Post Office on your left. After the post office, travel .4 miles and turn right onto Grove Creek Road (this quickly becomes a gravel road). Stay on Grove Creek Road for 4.8 miles. At the intersection with Lower Grove Creek Road continue left at this Y intersection to stay on Grove Creek Road. Continue on Grove Creek Road for 1.2 miles until you reach a four-way intersection. Turn left onto South Grove Creek Road. Continue on South Grove Creek Road for .9 miles to arrive at the Tippet Rise Art Center’s front gate. From Highway 78/ South Woodward Ave head south into Absarokee. Continue on Grove Creek Road. After 2 miles you will meet a four-way intersection, continue straight. The road becomes South Grove Creek Road. Disregard the “No Outlet” sign. From the Fishtail General store on Nye Road, head west toward the Post Office. After approximately 0.5miles, turn right onto Grove Creek Road (this quickly becomes a gravel road). Tippet Rise is closed for the season and will re-open on July 5, 2019 for sculpture tours. The 2019 summer concert season begins July 12. For information about any off-season events, visit www.tippetrise.org/events. Tippet Rise Art Center is located in Fishtail, Montana, off of Highway 78, south of Interstate 90 between Billings and Bozeman and a few hours north of Yellowstone National Park. Tippet Rise is an art center and working ranch where large scale sculptures are distributed across 12,000 vast and hilly acres and share pastures with cows and sheep. Classical music concerts are held in the Olivier Music Barn and at various outdoor venues. The sculptures at Tippet Rise can be explored by taking a guided tour by van, or without a guide by foot and by mountain bike. Van tours need to be reserved in advance and take 2-2.5 hours. Please arrive 20-30 minutes before your tour’s scheduled departure. Hiking and mountain biking are encouraged, but attendance is limited. Please reserve your space. Bring your own mountain bike or come prepared to hike. If you plan to bike, helmets are required.The distance between sculptures varies from ½ mile to 3 miles and the terrain is hilly with long grades of up to 15%. Plan to spend at least a half day. During Season Three, pastries, sandwiches, light snacks and beverages will be available to purchase during regular opening hours. For concert ticket holders and sculpture tour guests, dinner will available for purchase before each evening performance. Water and a water bottle filling station are also available at the Visitor Center. * Tippet Rise is a working ranch. A friendly reminder: please do not approach, pet or feed any animals. * Pets are not permitted at Tippet Rise. * Please adhere to all marked signs and stay on marked roads and trails. * Tippet Rise is entirely non-smoking. Thank you for visiting Tippet Rise! During the summer season, concert ticketholders and tour guests can purchase morning pastries, coffee and tea, plus lunch and dinner, as well as wine and craft beer. All fare is prepared by Cordon Bleu-trained Chef Nick Goldman and Chef Wendi Reed of Wild Flower Kitchen and is served in Will’s Shed, adjacent to the Olivier Music Barn. Wild Flower Kitchen uses natural, organic and local ingredients when available. To learn more about Wild Flower Kitchen, please visit their website and listen to this wonderful story from Yellowstone Public Radio’s Flavors Under the Big Sky, recorded in August of 2017. Lodging in the region surrounding Tippet Rise varies from hotels in the bustling downtowns of Billings and Bozeman to cabins, guest ranches and private homes within a half hour of the art center. Look to the following agencies for insight on accommodations for your visit to Tippet Rise and beyond. When is Tippet Rise open? Tippet Rise opens for Season Four on Friday, July 5, 2019. When and where can I purchase concert tickets and/or make tour reservations for the 2019 season? Concert tickets will be available through a randomized drawing, for which registration is required. The registration process will open on Tuesday, February 19 at 12 PM (noon) Mountain Time and close on Monday, March 11 at 5:00 PM Mountain Time. Winners will be selected at random on Tuesday, March 12 and notified by email. Sculpture tour reservations can be made here. The best way to stay informed about ticket sales and events is to sign up for our digital mailing list; to do so, just enter your e-mail address at the bottom of this page. Do I need a reservation to visit Tippet Rise or to take a tour, or can I just come? All guests need a tour reservation or a concert ticket for an event to visit Tippet Rise. Do I need a reservation if I am hiking or biking? Yes, please make a reservation on our website. Van, hiking and biking tours are sold out. May I visit anyway? Unfortunately, no. The number of visitors to Tippet Rise is limited each day; therefore, all guests must have a reservation. I got one tour ticket. May I bring my three children? You will need to make a reservation for each person in your party, whether you are hiking, biking, or touring in a Tippet Rise van. If you are touring by van, a reservation guarantees a seat on a van at the time of your choice. How long does the van tour take? Two van tour options are available: the full tour, which visits all of the art center’s sculptures and lasts approximately 2.5 hours, and the half tour, which visits a pre-selected route and number of sculptures and lasts approximately 75 minutes. This does not include parking your vehicle, walking to and checking in at the Visitor Center, and, if you wish, walking to the three sculptures located on the Visitor Center grounds and within the Visitor Center. Please plan to arrive at least 30 minutes in advance of your scheduled departure time. Is the van tour accessible to people with disabilities? Is the Visitor Center accessible to people with disabilities? Yes! Designated accessible parking spaces are located adjacent to the visitor center. Please ask the gate attendant for directions to this parking area. Restrooms in the visitor center are accessible. I want to tour the sculptures by bicycle or on foot; is it easy to get from sculpture to sculpture? If you would like to tour all of the sculptures by bicycle, plan on biking a total of about 13 miles. Much of your journey will be uphill and on gravel roads. You are welcome to customize your tour, making a shorter journey if you wish. The art center maps at the top of this page will help you plan your tour. Please bring your own bicycle and helmet (required). Tippet Rise currently offers 9 miles of hiking trails. Trails link the following sculptures: Daydreams, the Inverted Portal, the Domo, Beethoven’s Quartet and Proverb. A Hiker shuttle is available daily to assist guests who may want to be driven up to a specific hiking trail. When you check in at the Visitor Center for a hike or bike, a staff member will assist you in planning your adventure. Please see the art center maps at the top of this page for more information. Whether you are hiking or bicycling, you are welcome to stop at the Visitor Center to fill your water bottle, buy a snack, use the restroom, view the Olivier Music Barn and see the three sculptures located on Visitor Center grounds. Because visitor safety is our highest concern, all hikers and bikers must check in and out at the Visitor Center. I want to bring my large group or a school group to Tippet Rise. Please contact us with details about your request by e-mailing info@tippetrise.org. I can’t visit on the days you are open. May I visit during the week? Unfortunately, no. Mondays through Thursdays are reserved for rehearsals, ranching and education. How do I get to Tippet Rise? Please see the Directions section of the Plan Your Visit page on the Tippet Rise website. Please consider printing these directions before you make your trip; cell phone service will not be available as you get closer to the art center. Do you have an application for Artists in Residence? Tippet Rise currently does not offer an Artist in Residence program; however, this is something that we may offer in future years. I am a sculptor/painter/musician and I would like to submit my work/perform at Tippet Rise. We have completed our music schedule for the 2019 Season. If you are interested in performing in future years, we encourage you to contact us at info@tippetrise.org. While we are not planning any art installations in the near future, you are welcome to submit a proposal to us by email for future years. When do tickets for the 2019 concert season go on sale? Tickets for the season’s performances will be available through a randomized drawing, for which registration is required. The registration process will open on Tuesday, February 19 at 12 PM (noon) Mountain Time and close on Monday, March 11 at 5:00 PM Mountain Time. Winners will be selected at random on Tuesday, March 12 and notified by email. The message to drawing winners will include details on how and when to purchase tickets. Are concert tickets only available through a drawing? Yes, concert tickets will be sold only to drawing winners. 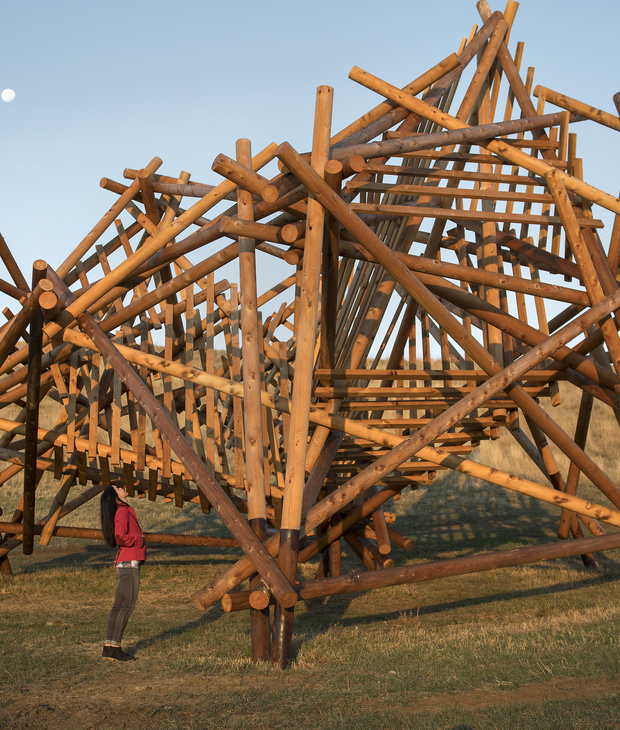 If tickets become available through cancellations, after the drawing has concluded, they will be posted for sale on the Tippet Rise website on a first-come, first-served basis. I forgot to register for the drawing. Will there be other chances for me to purchase tickets? Yes! Keep checking our website during the concert season. Tickets that become available through cancellations will be posted for sale on the Tippet Rise website, on a first-come, first-serve basis. How do I register for the drawing? A disposable email address is an alternative email address which serves as an alias for your true email account and forwards all mail it receives to your true account. Every registrant will be entered into a digital drawing in which the winners will be selected at random. The drawing will take place on Tuesday, March 12, 2019. Winners will be notified via e-mail on that day. Those who have not won will also be notified, by email, at that time. Winners may purchase up to four tickets during the ticket purchasing period, which begins on Wednesday, March 13 at 8:00am Mountain Time and concludes on Sunday, March 17 at 5:00pm Mountain Time. How many times can I register for the drawing? Registration is limited to one entry per person. Anyone with a valid e-mail address may enter. Duplicate registrations will be discarded, including second entries made with disposable email accounts. A disposable email address is an alternative email address which serves as an alias for your true email account and forwards all mail it receives to your true account. Is there a limit to the number people from one household who can register for the drawing? No. Registration is open to anyone with a valid email address. Registration is simply limited to one entry per person. How much time do I have to register? Registration for the drawing opens at on Tuesday, February 19 at 12:00pm (noon) Mountain Time and closes on Monday, March 11, at 5:00pm Mountain Time. When is the drawing and notification? Winner and non-winner notifications will be sent via e-mail on March 12 at 12:00pm (noon). If I am selected through the drawing, when do I order tickets? Winners may purchase up to four (4) tickets to one performance or divide them among multiple performances. Purchases must be made between Wednesday, March 13 at 8:00am Mountain Time and Sunday, March 17 at 5:00pm Mountain Time. Please note that tickets are available to drawing winners on a first-come, first-serve basis and some concerts may sell out faster than others. What happens if I don’t use my entire four-ticket allocation? Winners are not obligated to purchase all four of their allotted tickets. If any tickets remain from the initial drawing, they will be offered via a second drawing. What happens if I forgot to buy tickets during the purchase window? Unfortunately, you will have forfeited the opportunity to purchase tickets for the 2019 season. We will send two reminders during the purchase window, one right before it opens and one right before it closes. Hopefully, these will prompt everyone to purchase their tickets. Tickets are $10 for adults, and free to those who are 21 or under. (While tickets for those 21 and under are free, they still count as part of the four-ticket-per- person limit and must be reserved in advance). If tickets for children are free, why do they count towards my four-ticket allocation? Although tickets are free to young people, everyone—including young people—must have a ticket to attend a performance at Tippet Rise because our concerts take place in small spaces with very limited seating. Tippet Rise hopes to entice young people to give classical music a try…and then to become terrifically passionate about it. To that end, tickets for performances at the art center are free to those 21 and younger. Should I identify in advance the concerts that I want to attend? Yes. Although winners are guaranteed the opportunity to purchase up to four tickets, there is no guarantee that the specific performance(s) of their choice will not sell out before they are able to secure tickets. What if my name is not drawn? You will receive an email notification if your name is not drawn. Should tickets remain after the purchase period ends on Sunday, March 17, and you are registered, you will be automatically entered into a second drawing which will take place on Monday, March 18, and winners will be notified that day. How do I claim my tickets? Tickets must be purchased online with a credit card. Use the purchase link in your winner’s notification email. Tickets are not mailed to purchasers. Your tickets (in your name) will be available at the Tippet Rise entry gate on the day of your concert. Please email info@tippetrise.org and a representative from our box office will call you to arrange your ticket purchase. Yes, you may give your tickets to someone else, but the tickets will still be at the entry gate under your name, or the name of the person to whom they were originally issued. Yes, tickets are refundable by contacting info@tippetrise.org. Cancellations made less than 48 hours in advance are not refundable. Will tickets be available through cancellations? If tickets become available through cancellations during the concert season, after the drawing has concluded, they will be posted for sale on the Tippet Rise website on a first-come, first-served basis. Where do I go on the Tippet Rise website to look for cancelled tickets? Do I need to use the drawing system to book a sculpture tour?